Vallnord-Arcalis, Andorra – February 13, 2015 – The competition in Vallnord-Arcalis today was held under blue skies but in tricky snow conditions. The chosen venue in Andorra was characterized by an unprecedented density of features on the face and a great variety of lines. With this contest the women skiers have completed their qualification for the next stop of the tour, which will only include the top 7 women in the overall ranking. The other categories only have two results so far. They still have the possibility of getting in a third result counting for the Fieberbrunn Kitzbüheler-Alpen stop, restaged here in Andorra within the competition window ending on Thursday. The women’s skiing category was particularly exciting today, because it was decisive of who is qualified for the next stop which will take place in Haines, Alaska (USA) on March 14th. Two Americans, Jackie Paaso (USA) and Hazel Birnbaum (USA), were in the "hot seat," ranking 6th and 7th respectively, and both made it in. Hazel showed a very decisive run today with great action earning her the top score of 78.75 and her first FWT victory. "I was pretty nervous coming in to today. I fell in the last event. I really wanted to go to Alaska and represent our home country," Hazel said at the bottom. "I just wanted to stay on my feet. Last time was a pretty big ego-crash. I can’t believe I won. Now I’m going to celebrate with my friends – I’m going to my home state of Alaska!" Eva Walkner (AUT) continued her streak of podiums with a second place and a score of 75.00, laying out hard, dropping aggressively into the steep part, almost using the features to steer her down the steep top section. The 3rd place was taken by Francesca Pavillard-Cain (USA) who started out with a nice big air off the top lip, continuing playfully with a traversing air towards the skiers left and putting another good size air into the middle section. A solid run scoring her 72.25 out of the 100 points possible. The man of the day was Sam Smoothy (NZL), who scored an impressive 91.25 and took 1st place in men’s skiing. He picked the skiers right of the face as one of the only riders, linking the spread out snow pads with big air in excellent flow, keeping breath-taking action all along the face. A happy Sam, who sees his possibilities of qualifying for Alaska re-opening, found confidence to send it in the conditions that he said were close to what he knows from home in New Zealand. "Going into Andorra, I really needed a good result. I just felt right at home here. I’m super psyched – it was an all-or-nothing run and it worked for me." With bib number 2, Jeremie Heitz (SUI) set the standards for the day right off the bat, with a score of 82.00. He laid out a fast, fluid run starting with a very technical jump into the steep couloir, impressing the judges right away. Only Sam’s spectacular line could beat that and left him with the second place. Finally the stomp master, Reine Barkered (SWE), confirmed his podium from Chamonix-Mont-Blanc with a line close to Jeremie’s, giving him a score of 81.25 squeezing him in just ahead of Rodney George (USA) who had a score of 81.00 in a very tight top field. Reine is now leading the current standings and said he is feeling more relaxed about the upcoming events. "Today I was actually not nervous at all in the beginning, and then I got up to the start and got really nervous for some reason. Surprised though, I had a pretty straightforward line I think, but of course you don’t know if you are going to ride it well. Snow was okay and I got most of my features in and landed clean I think and it went really fast so I’m super happy with a 3rd place here today. This of course, puts me in a really good position now for the Tour with a 2nd and a 3rd place it should be really good, I think, so it definitely takes a lot of pressure off for the upcoming events opening up so I can really go full charge, with a no holding-back-kind of riding." 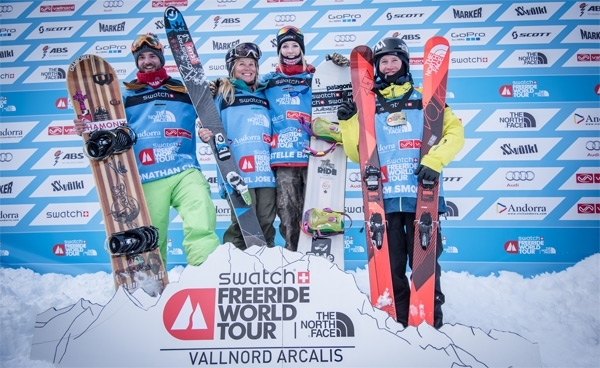 Today’s event in Vallnord-Arcalis was the first time that the Swatch Freeride World Tour by The North Face® had a competition stop in Andorra. The local FWQ rider Dani Fornell-Prat (AND) competed on a host’s wild card and was thrilled to be a part of this: "We are really proud to host the Tour here. Five years ago this was inconceivable and here we are. The media have been talking about this for months and months. Everybody here wanted for all these ‘animals’ to come and compete here." Dani didn’t let down his local fans, putting down an absolutely spectacular run with a huge air going into the face and sending it almost into orbit on the bottom, being drawn down in the score only by a few small control issues in the middle. With a score of 71.75 he placed 12th in today’s action packed event. Just following today’s event, it was announced that the conditions forecasted will not allow for the resumption of the Fieberbrunn Kitzbüheler-Alpen event to take place tomorrow. However, the possibility of making it happen here in Andorra stays open until Thursday February 19th 2015. Updates will be posted as soon as a decision has been made to confirm a date and face for this event or if it has to be cancelled all together.